We have great news for you ladies! Jacks or Better, one of the most popular video poker games, is now available at our lady’s casino. You only win if the final hand at the very minimum includes a pair of jacks or better. Also remember that the better your 5-card hand is, the more money you’ll win. The main reason why this game has managed to stay so popular for so long is a testament to how fun and enjoyable it actually is to play this game. Every gambling woman should give it a try. Much like many of the other great video poker games at Lady’s Casino, Jacks or Better offers great fun. 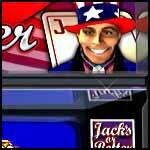 The object of Jacks or Better is to obtain a five-card poker hand that contains a winning combination (check the machine paytable first). The better your hand, the bigger the payout. You choose how many and which of your cards will be replaced. This can only be done one time per game.